Vegas Baby! 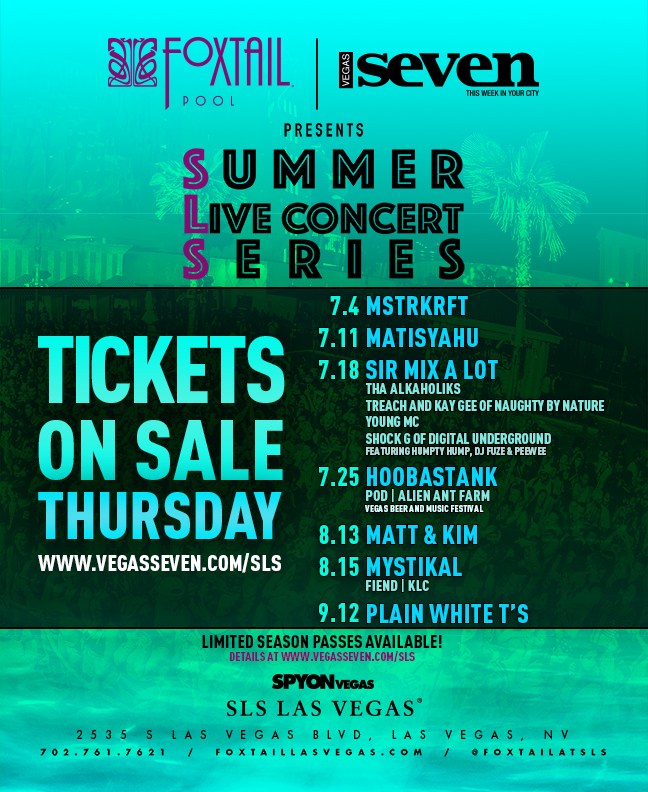 Summer Live Concert Series at SLS Las Vegas | Do You Hear The Music? All my Vegas peeps and friends who are looking to make a trip out to Vegas this summer I have your Saturday nights planned for you! Behind the scenes I’ve been working with my good buddy, Mike Henry of The Bunkhouse to put together a summer concert series lineup for the Foxtail Pool at SLS Las Vegas. We’re talking a fireworks worthy show with MSTRKRFT, reggae on a hot Vegas night with Matisyahu, an old school hip-hop show with Sir Mix A Lot, Naughty by Nature, Shock G, Young MC and Tha Alkaholiks, Hoobastank with POD and Alien Ant Farm, Matt & Kim back in Vegas for their first time since destroying their set at Life is Beautiful last fall, the Las Vegas debut for Mystikal with Fiend and KLC, Plain White T’s and more to be announced! All these shows (except for one) are on a Saturday night, booze will be flowing, the pool will be available for open swim and we’re going to have a fun time partying to the lineup below. That’s the key, FUN, and these shows are all about it! Tickets go on sale Thursday, hope you can make it! Also the most killer deal of all, you can get a “season pass” which will grant you entry to each show throughout the summer. We’re going to be adding more shows so this is a killer deal. See you on July 4 for a rocking set by MSTRKRFT!